We host workshops for children and adults, many of them on our Drawing Room deck in Seal Harbor. • Children's art/nature workshops five days a week, most in Seal Harbor, some in Northeast Harbor. Parents are welcome too. In fact, we suggest that children under 7 be accompanied by a parent or other adult. 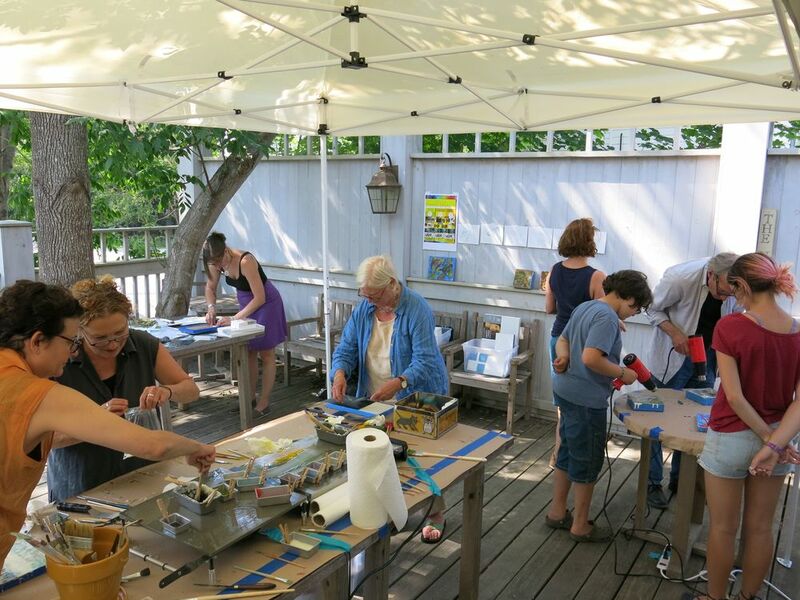 • Adult and teen art workshops in Seal Harbor in August, led by Dina Helal (below) of the Whitney Museum and Margaret Krug (second photo below) of Parsons The New School and the author of An Artist's Handbook. Margaret's workshop, on color, will be Sunday, Aug. 17 from 1 to 4 p.m., with a fee of $40. Dina will lead encaustic-painting workshops on Tuesday, Aug. 19, from 1 to 4 p.m. and Wednesday, Aug. 20, from 1 to 4 p.m., also with a fee of $40. Spaces are limited. 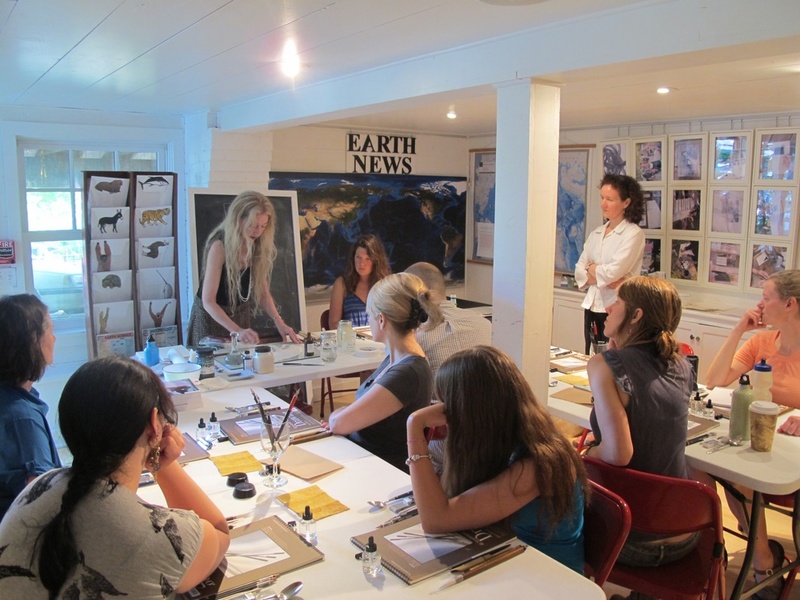 One of the encaustic workshops taught last summer by Dina (second from left). Here's Margaret leading one of her past workshops at the Notebook in Seal Harbor. She is not only a teacher but also a superb artist, art historian and writer (in books and for American Artist magazine). Katie gave Pamelia and me a tour of the Jet Propulsion Lab in March. That's where the Mars Rover project is based. Pamelia with Alex in our Big Bang Room when he visited last September for his keynote speech at the Acadia Night Sky Festival. Pamelia and I with Bernd at his cabin in western Maine last year. At his Notebook talk and signing last summer, Bernd gave us a peek at the cover of his latest book, which didn't come out until April 2014. You never know what scoops you'll get if you come to the Notebook! Eileen, a Seal Harborite, will read from her new book. Taste two honeys per day and vote for your favorite—the winner moves on to the next round of the tournament! Can Maine Wild Raspberry defend its 2013 title? And much more. Below is the current day-by-day schedule, which we will update as changes occur. Remember to like and follow the Facebook page for The Naturalist's Notebook for daily reports! Seal Harbor Naturalist’s Notebook, 10-11:30 a.m.
Jordan is both a gifted artist and a serious naturalist and biologist. Shannara (right, with fellow Notebooke Gem Lawrence) ran our color-themed 13.8-billion-year art workshops at the Northeast Harbor Notebook Annex last summer. Amy, an artist and horticulturalist, has been painting an Acadia National Park carriage road scene in the Notebook in Seal Harbor. Pamelia and I and animation genius Dan McCoy of Pixar took part in one of Amy's botanical drawing workshops last summer. Her class is for all ages! Seal Harbor Naturalist's Notebook, 3:30-5 p.m.
Q-and-A about Mars and the Mars Rover with Katie Stack Morgan (below), a scientist from Caltech and the Jet Propulsion Lab in Pasadena, Calif., who works on the Mars Rover project. Katie is young, dynamic, incredibly nice and a great role model for girls in particular. Come meet her! She is going to curate a Mars Room at The Naturalist's Notebook over the next two years. She'll be around until 5 p.m. to talk and answer questions. Katie with me in March at the JPL's Mars Yard, which is used to test Mars Rovers. Jordan has been painting the walls and ceiling of our Forest and Tidal Room in Seal Harbor with a scene that extends from Mount Katahdin to the rocky coast. Seal Harbor Naturalist’s Notebook, 2-3:30 p.m.
Robin has been curating our Ocean Room in Seal Harbor. She has been painting the floor and walls and building ocean-themed installations. Robin led needle-felting workshops last summer at which children created ocean animals to help us build a healthy coral reef. She'll do that again as part of her workshop series. Eliza, who helped us create a downtown Northeast Harbor birding walk last summer, also helped out at a marbleizing workshop in Seal Harbor. Stay tuned—we may be holding another of those with teacher Shira Singer. In fact, here's Shira Singer leading a marbleizing workshop last summer. We created planets! Jordan is a natural explorer herself. Here's a shot of her from a few years ago doing a gull count on Egg Rock. Moore Auditorium, Schoodic Institute in Winter Harbor, 7 p.m.
Alex Filippenko (below) of the University of California at Berkeley, one of the world's best known and most entertaining astrophysicists, will give a Naturalist's Notebook-organized talk hosted by the co-sponsor, the Schoodic Institute (SERC) in Winter Harbor at 7 p.m. Alex, who has been named the national educator of the year and been voted the best professor at Cal nine times, has playfully entitled his talk, "Exploding Stars and New Planets and Black Holes, Oh My! Frontier Research at Lick Observatory." He will weave together the fascinating story of Lick, one of the world's historic observatories, and the exciting discoveries that are still coming out of it. He'll also offer insights on the Perseid meteor shower, which will be peaking at that time. It's a talk not to be missed, and Alex will stick around afterward to field questions, pose for photos and share his boundless enthusiasm for astronomy. Naturalist and writer Bernd Heinrich (below) will reveal some of his latest field discoveries in a fun and enlightening talk entitled, "Blue Jays: American Chestnut Tree Planters," hosted by the co-sponsor, the Schoodic Institute (SERC). Pamelia and I were lucky enough to be with Bernd when he was doing some of his research on this subject at his cabin in western Maine. Bernd’s talks are always filled with surprises, insights and humor and this one will be no exception. It will be a great evening, and Bernd will field questions and be available to chat and sign books afterward. Bernd Heinrich illustrates all his books. The Notebook currently has a show of 14 paintings that will appear in his next book, on birds, which is due out in 2015. 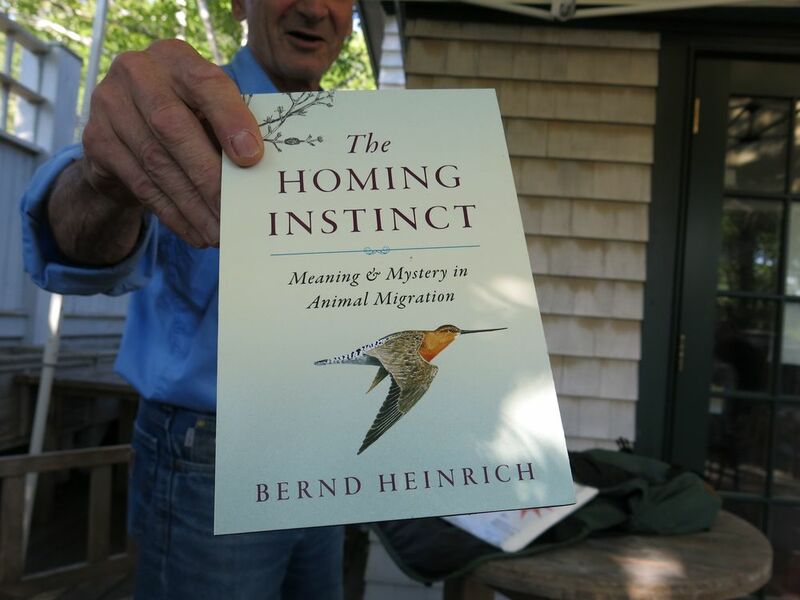 Seal Harbor Notebook, 3:30-5 p.m.
Reading and book signing by Bernd Heinrich. Bernd will read from his latest release, The Homing Instinct, and possibly tell us about his top secret book-in-progress, due out next year. We will have all of Bernd's book titles available to purchase as well as exclusive prints of his art. Bernd with Pamelia on the deck of the Notebook in Seal Harbor last summer. Seal Harbor Naturalist’s Notebook, 1-4 p.m.
Seal Harbor Naturalist’s Notebook, 3:30-5 p.m.
Book reading and signing by John Anderson of College of the Atlantic, author of Deep Things Out of Darkness: A History of Natural History. John (below) is a professor of ecology and natural history and holds the W.H. Drury, Jr., Chair in Evolution, Ecology and Natural History. He is currently researching nesting seabirds and island ecology. Seal Harbor Notebook, 4 p.m.
Reading and book signing by Eileen Rockefeller (below) of Seal Harbor, author of "Being a Rockefeller, Becoming Myself: A Memoir."